It has been originated in India. It is found in South East Asia and throughout India. It is erect, slender, roughly pubescent herbs, 30-60 cm high. Leaves are opposite, very reliable, sessible, narrowly lanceolate, toothed or nearly entire. Flowers are white with pappus of 2-5 minute teeth. Chemical constituents:: Eclipta alba oil has various chemical compounds that include Saponin, tannin, vitamin A and ecliptine. It is used to treat cirrhosis, hepatitis or enlargement of spllen and the liver. 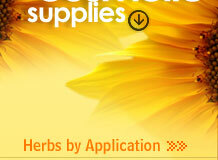 It is also useful in anaemia, skin disorders, headache, insomnia and mental disorders. It has restorative properties that can help assist in the treatment of premature greying of the hair, alopecia and balding. It work as a general antiseptic and astringent oral mouth washfor infected gums and loose teeth. It helps in maintaining and rejuvenating teeth, bones, hearing, memory and sites. Bhringaraj has a Keshya effect, meaning that it directly nourishes and improves the hair. It is especially good for the liver, which is governed by the subcategory of Pitta called Ranjaka Pitta. Ranjaka literally translates as "that which colors", and explains the ability of Bhringaraj to balance and improve hair color from within. By improving liver function, Bhringaraj also helps to remove and prevent impurities (Ama) throughout the body. Oil is excellent for scalp and foot massage, promoting healthy hair growth and deep sleep. Roots and leaves stimulate the flow of bile into the intestine. The root is used as an emetic and purgative (laxative). The leaf juice is used as a liver tonic. It is believed to prevent aging, maintain and rejuvenate hair, teeth, bones, memory, sight and hearing. It is a rejuvenative for pitta, kidneys and liver. The root powder is used in Ayurvedic medicine for hepatitis, enlarged spleen and skin disorders. 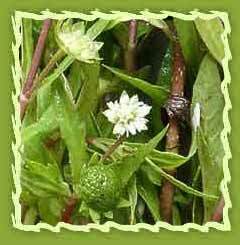 The herb is used as hair tonic, the oil removes greying, balding, makes the hair darker. (Make hair oil by boiling leaf juice in coconut oil). The hair blackening action of the herbs might be based, in part, on a doctrine of signatures. The eclipta plant, when broken, exudes a blackish sticky juice.